Do you really know what is causing late starts, or is everyone just pointing fingers at each other? Improvement requires good root cause analysis into the real reasons for your issues. 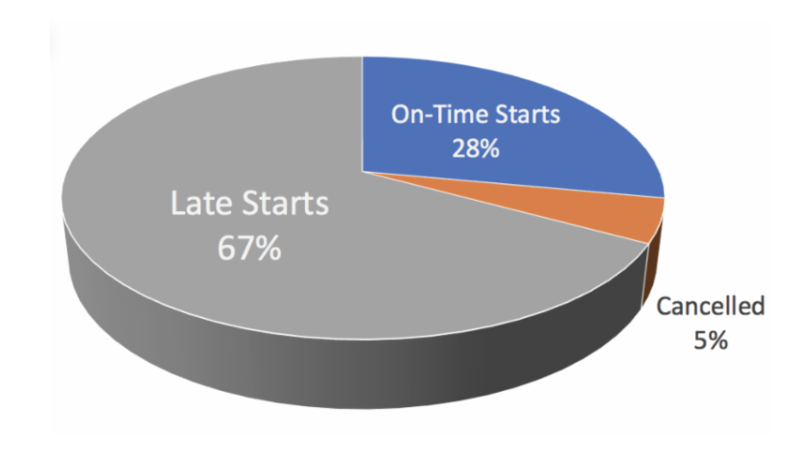 Here are 5 critical areas that impact on-time starts. The importance of pre-Admission testing and synchronization with physician offices is often underestimated. Patients on time, with proper testing, consultations, and completed chart remove excuses and set a foundation for success. Having the right instruments, supplies and equipment in the right place at the start of the day (and all day) requires reliable materials management systems. Precious minutes lost to searching, especially on first start cases, can have ripple effects all day long. Readiness goes beyond attitude and desire. Effective teams have well defined roles, clear written expectations and openly discuss what’s working and what’s not. Each person understands the game plan and knows what “ready and on-time” means for their role. Room, patient, and personnel assignments are clear and consistent. Well defined processes ensure that change does not create chaos. Clear communication, smooth transitions, and synchronization across all staff and departments allows for reliability and flexibility. Changes happen. Chaos does not have to result. Clear and timely measures create accountability and give crucial insights. Data that speaks for itself keeps people focused on reality and improvement while reducing the difficult conversations and unproductive finger pointing. While these concepts sound simple, there is a lot of work in the details. And even the best solutions often require expert change management to become reality. We have over twenty years of experience helping clients make these changes come to life. We can help you achieve your goals!